Saint Anselm College is a private, Benedictine, Catholic liberal arts college in Goffstown, New Hampshire. It was founded in 1889 and named after Saint Anselm of Canterbury, the Archbishop of Canterbury from 1093 to 1109. 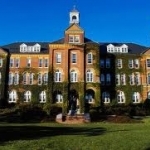 The ghost of a man has been observed roaming about the fourth floor of Alumni Hall at Saint Anselm College in Manchester, New Hampshire. Student lore says that the ghost is that of a man who killed himself by jumping out of a fourth floor window. The ghost is that of a monk of Saint Anselm Monastery, attached to the college.